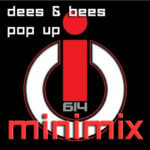 Promo Mix for the Collective Intelligence Dees & Bees Pop Up from the one like Habikki. If you enjoy this and would like to subscribe to future postings checkout Habikki’s Soundcloud Page. Mixcloud Page, Facebook Page or subscribe to the Luvs.org Music Feeds.